The approach helps individuals and group members, view issues and challenges from different perspectives, which then assists them with their problem solving. The more the “Thinking Hats” are used, the more it becomes part of a thinking culture. It can save time that may otherwise be wasted in argument or drifting discussion. It can help keep emotions and egos in check that may otherwise contribute to poor decision making, ineffective group processes or groups becoming dysfunctional. It will help unlock creativity and it helps organise each group member’s thoughts and ideas, maximise their overall contribution and helps them collectively get to solutions with a shared vision more quickly. It is described as a way of getting parallel thinking, which means that each person is looking and thinking in the same direction, but changes in theme as the hat changes. At first you might feel a little awkward using the different hats, but this awkwardness will soon pass as the convenience of the system becomes apparent. The great value of the hats is that they provide thinking roles. A person can take some comfort from play acting each of these roles, rather than any particular role becoming their identity within the group. Without the formality of the “Hats” approach, some thinkers would remain permanently stuck in one mode (usually the black hat mode) and not contribute fully to the group. 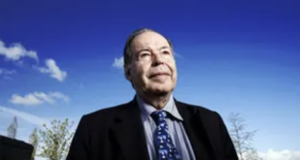 Edward De Bono introduces his concept of the six hats in this short video, click on the image below. Image source: The Guardian. Photographer: Christopher Thomond. The approach is described fully in his book, Six Thinking Hats (1985). A template for using the approach with a group is provided by the University of South Australia, here. An important point is, that when using the approach with a group, each person needs to have the same “hat” on at the same time. Virgin white, pure facts, figures and information. When wearing the white thinking hat, the thinker should imitate the computer. White hat thinking is a discipline and a direction. The thinker strives to be more neutral and more objective in the presentation of information. Seeing red, emotions and feelings, also hunches and intuition. The red hat allows the thinker to say how they feel about the matter. The red hat provides a convenient method for a thinker to switch in and out of the ‘feeling’ mode, in a way that is not possible without such a device. The red hat allows a thinker to explore the feelings of others by asking for a ‘red hat review’. When a thinker is using the red hat there should never be any attempt to justify the feelings or to demand a logical basis for them. Devil’s advocate, negative judgement, why it will not work. The black hat thinker points out risks and dangers. Black hat thinking may point out the errors in the thinking procedure and method itself. Black hat thinking may project an idea into the future, to see what might fail or go wrong. Black hat thinking can ask negative questions. Sunshine, brightness and optimism, positive, constructive, opportunity. Yellow hat thinking probes and explores value and benefit. Yellow hat thinking strives to find logical support for any identified value or benefit. Yellow hat thinking is constructive and generative. From yellow hat thinking comes concrete proposals and suggestions. Yellow hat thinking is concerned with making things happen. Fertile, creative, plants springing from seeds, movement, provocation. The person who puts on the green hat is using creative thinking. The search for alternatives is a fundamental aspect of green hat thinking. There is a need to go beyond the known, the obvious and the satisfactory. Provocation is an important part of green hat thinking. A provocation is used to take us out of our usual patterns of thinking. There are many ways of setting up provocations, including the random word method. Cool and controlled, orchestra conductor, thinking about thinking. The blue hat thinker organises the thinking itself. Blue hat thinking is thinking about the thinking needed to explore the subject. The blue hat thinker calls for the use of the other hats. The blue hat thinker defines the subjects towards which the thinking is to be directed. The blue hat thinker sets the focus, defines the problems and shapes the questions. Blue hat thinking is responsible for summaries, overviews and conclusions. Even when the specific blue hat thinking role is assigned to one person; it is still open to anyone to offer blue hat comments and suggestions. Thinking and Mind Tools. University of South Australia. Teaching and Learning in Health Sciences. 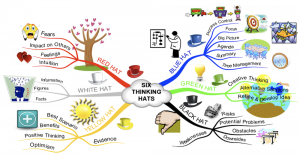 De Bono’s Six Hats. BYU Center for Teaching and Learning. Bellarmine University. Six Thinking Hats.